The one thing to keep in mind when travelling to or working in Antarctica is that the weather always has the last say. Schedules are flexible and specific flight times should be taken with a grain of salt and the knowledge that they could be bumped up or moved back by several days at the last minute. We were hoping to leave McMurdo for Pole yesterday, however all flights were given a 24hr weather delay. It’s still “condition 2” here this morning at -11F (-40F windchill) and 23knot winds. The limiting factor is visibility. Pretty much all the planes down here require 3 miles of visibility to fly, right now we have less than a 1/2 mile due to blowing snow. Here in McMurdo the two topics of conversation for Polies are weather and flight schedules. Until mid-late November the weather at Pole is too unpredictable to really count on scheduled flights – being either too cold or too windy to land. It’s great to get people in as early as possible to relieve the winter crews and to help prep for the flood of people at the beginning of summer, so we’re staged in Mac Town early, just in case they can get a plane in. The military planes (and the Airbus) fly in from Christchurch, NZ, but the Twin Otters and Baslers fly down from Punta Arenas, Chile to Rothera Station (British Antarctic Survey) on the Antarctic Peninsula. 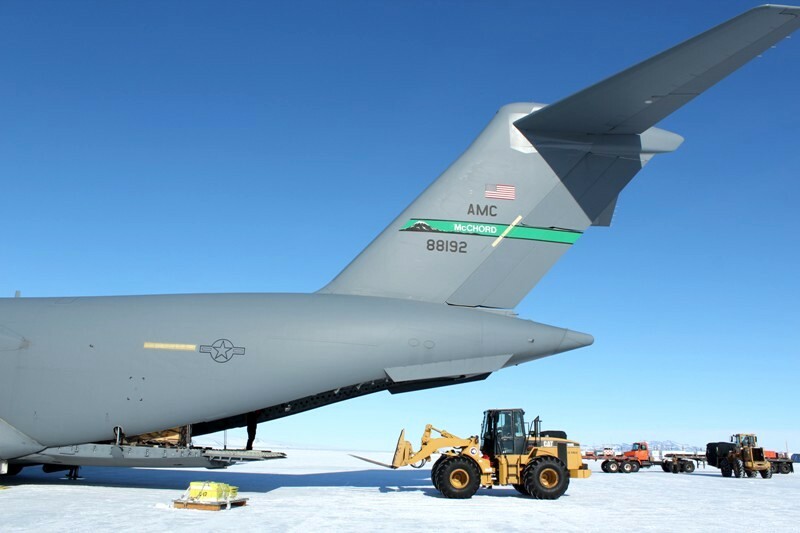 From there they fly to Pole where they refuel again and finally head to McMurdo. The first flight arrived at Pole on October 17th and medevac’d the winter site manager Renée Douceur (as you’ve probably seen in the news). On Monday October 24th the first Basler from McM made it in to Pole bringing in 16 from the summer crew. The first Herc flight was this past Saturday October 29th with 40 summer people! The original plan was to send two Baslers, as they can fly in slightly colder weather, and there were several days of alternating plans, delays of various sorts, and changing passenger manifests. In the end, the Herc made it on Saturday, leaving just seven of us Polies back here in McM. The Magnificent Seven. To be ready to fly at a moments notice we “bag dragged” on Friday. On flights to and within the continent everyone must wear the issued ECW and may bring only one of the issued orange bags as a carry-on. Everything else must be checked/palletized (put on a pallet to go as cargo). “Bag Drag” is a process of bringing everything that you have here up to the MCC (movement control center) where all the luggage to be checked is tagged and weighed and then each person is weighed on a giant scale – with their full ECW and carry-on. In some respects it’s nice to have all my luggage out of the way and be ready to fly, but meanwhile I’m living out of my one orange bag for however long it takes to get us and our pallet of luggage to Pole – hopefully a matter of days, but potentially weeks. Meanwhile here in McMurdo, we’ve been training with some of the heavy equipment we’ll have, helping sort out food heading to Pole, working with other departments, and helping prep for the South Pole Overland Traverse (aka “SPOT” I’ll write more about them later on). I also had the chance to observe a C-17 flight from Christchurch. At the South Pole, and at Summit Station, Greenland, we work primarily with the ski-equipped LC-130 Hercules planes. Last year I flew to McMurdo from New Zealand on a C-17, so it was a new experience to see the loading/unloading process up close. At 174ft in length and with a 170ft wingspan the C-17 Globemaster is a powerful and versatile plane, impressive to see up close, especially on the ice. Some differences between the planes: The C-130 Herc is a four engine turboprop plane, 97ft in length and with a132ft wingspan. It can carry 92 passengers or 6 pallets up to 45,000lbs. The Hercs used down here by the NSF are ski-equipped so they can land on the relatively soft runways at Pole and Summit. The C-17 Globemaster on the other hand, is 174ft long and with a 170ft wingspan that makes the Hercs pale in comparison. The one used here by the NSF is based out of McChord Air Base near Seattle. The C-17s can carry up to 18 pallets and over 170,000lbs. The flight I helped with brought in 10 pallets and 20 passengers. We loaded on a T-5 shipping container (5 pallets long) and a handful of other single pallets and passengers. A CAT 950 loader approaches the C-17 to pluck off a single pallet of cargo. After unloading the cargo the plane crew removes the "teeth" on the end of the ramp in preparation for loading the huge T-5. They are helpful when forking pallets off the rear ramp, but not strong enough to support especially large or heavy pallets. The view from the rear of the C-17 after loading the huge T-5. The Hercs at Summit and Pole are only on the ground for a short while and leave the props running to prevent the hydraulic systems from freezing up, this makes working around the plane very difficult: the air behind the plane is filthy from the exhaust and tiny particles of unburned fuel, the noise is deafening, and the wind generated by the props is freezing. The C-17 however shuts down their engines so it’s not bad at all. The yellow tubes you can see in the photos, running to the engines and the landing gear, are blowing warm air from diesel heaters to keep everything warm. The runway in use here is on the sea ice – which despite being 88 inches thick can deflect 3-4 inches with the weight of the plane, equipment, and cargo. Surveyors continually take measurements around the plane during the cargo/fuel/pax operations to make sure the ice isn’t deflecting too far. Unless weather or mechanical issues dictate otherwise McMurdo receives multiple flights daily of Twin Otters, Baslers, the Airbus, locally based helicopters, C-130 Hercs, and the C-17. At Pole we might expect a schedule of 3-4 Hercs a day and possibly a Basler or Twin Otter or two. While we’re waiting to get to Pole I thought I’d write about some interesting facts and history regarding Antarctica as a whole and the stations that I will be at. First off – a map of the continent. At the very center is Amundsen-Scott South Pole Station, if you look straight below (and a little to the right) you’ll see McMurdo Station in red letters. On the Antarctic Penninsula, far left, is Palmer Station. 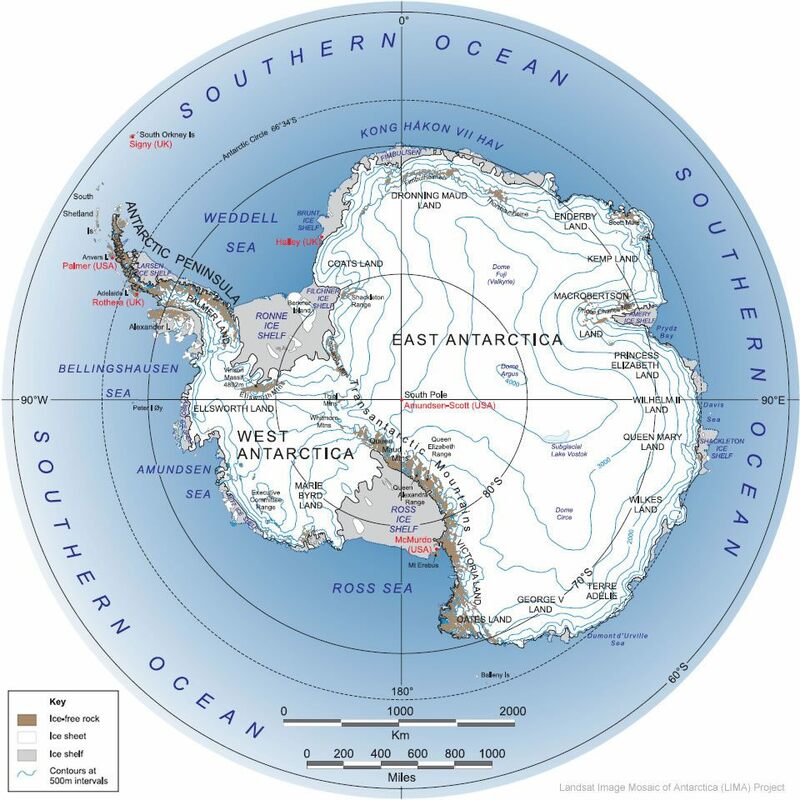 Antarctica is the highest, driest, coldest, windiest continent on earth. At 5.4 million square miles it’s almost twice as large as Australia, for scale the US is 3.79 million square miles. The average thickness of the Antarctic ice cap is 2000m (almost 7000ft), though it can exceed 4km in places (that’s over 13,000ft, or more than 10 Empire State buildings stood end to end!). While I’m at sea level here in McMurdo the surface rises gradually to reach nearly 10,000ft at the South Pole, and much of the East Antarctic ice sheet is at an even higher elevation. Technically a desert, Antarctica receives about 6 inches of precipitation per year on average. At the South Pole it is usually too cold and dry for actual snowflakes to form and fall. The current station was established in December 1955 by the US Navy and is built on the bare volcanic rock of Hut Point on Ross Island (a point some people use to argue that “Townies” have not technically been on the continent). Right now the ground here is fairly white with ice and snow, but during mid summer the McMurdo area will be brown pumice-like rock. The peak summer population in Mac Town is around 1,200 individuals. With telephone poles and power lines, crushed volcanic rock roads, stop signs, and over 100 buildings it feels very much like a mining town of sort. Large red trucks and 12 passenger vans share the roads with heavy equipment and the monsterous Ivan the Terra Bus. (Palmer on the penninsula and South Pole being the other two). It’s a mix between a community college, a mining camp, and a military outpost. People heading to field camps, the dry valley’s, WAIS Divide, or the South Pole all pass through here. 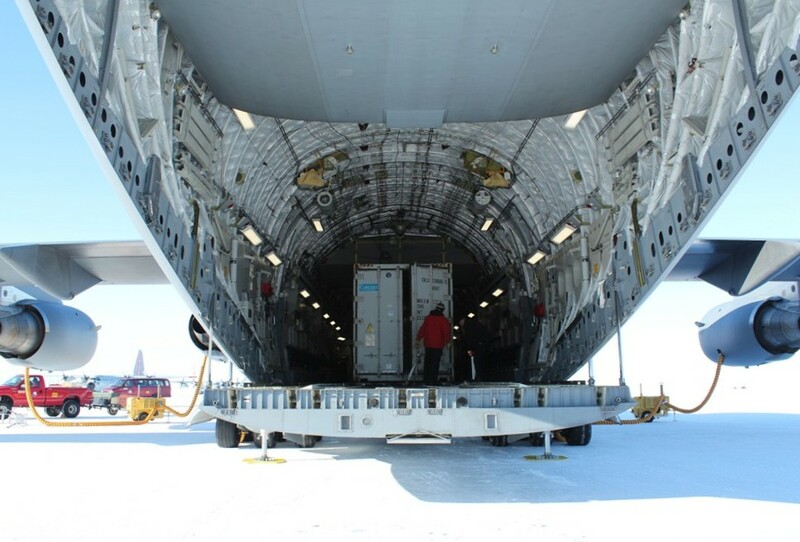 This includes most of the South Pole cargo team, which will be staged here until the first C-130 Hercules (aka Herc) flight scheduled for November 1. Flight schedules here are always taken with a grain of salt, and it seems that more often than not that a flight will be bumped up a day or given a 24 hour weather delay. Right now while it’s been a balmy -5F here in McMurdo, it’s still around -70F at the South Pole, well below the -50F the Herc limit. Luckily McMurdo is bustling with energy and plenty of tasking and training so there isn’t much downtime. In addition to hikes and taking in the impressive views of the mountains nearby we’ve been learning how to operate the heavy equipment we’ll primarily be using at Pole. CAT 953 and 950-G. As well as the details of building and planning cargo pallets. Everything coming to the South Pole is either dragged down via the “South Pole Overland Traverse” (aka SPOT) or is flown down on a Herc. 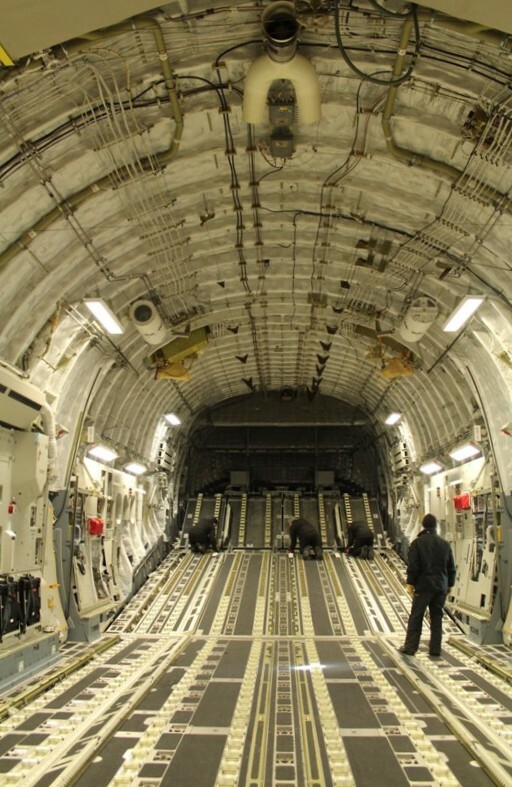 Material being flown on the Hercs must be loaded onto 88″x108″ Air Force pallets. With a core of balsa wood and a metal outer layer they’re relatively light and durable. One of the highlights of this week was a visit to Discovery Hut on Hut Point, just out of “town.” This site is specially protected by the Antarctic Treaty so visits are limited. One of the few designated people on station with a key to the hut offered to take a group of us “Polies” inside before we left McMurdo. The hut was built in 1902 by the 1901-1904 British Antarctic Expedition led by Robert Falcon Scott. Constructed of wood panels with a thin felt liner between it was too cold to live in and the crew resided primarily onboard their ship just off the coast. Originally one of several buildings, the rest were destroyed or damaged until the Antarctic Treaty dedicated it as a protected historical site. 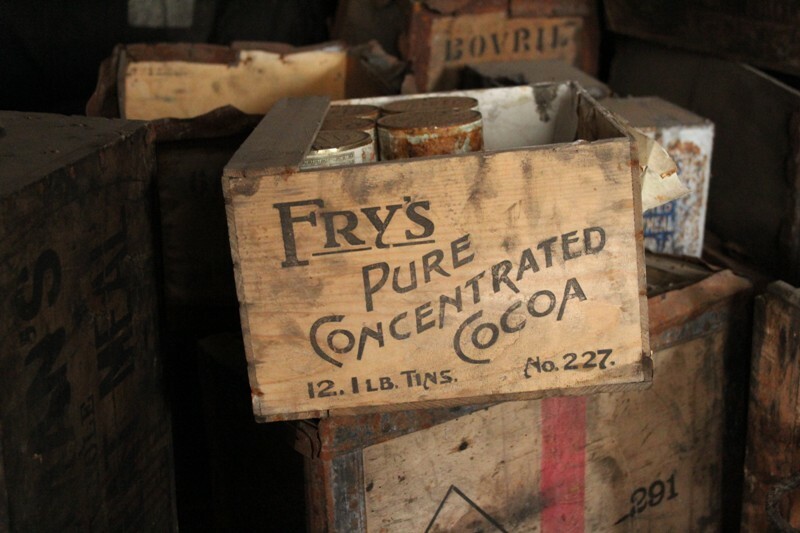 Today you can still see clothes hanging to dry, rations in wooden crates, and tin cans left on the shelves inside. Cold, dark, and eerie one can almost hear the bubble of water on the stove or the shuffle of feet clad in the felt and hide boots worn during that long expedition over a century ago. It’s Friday October 14th here at the largest base on the continent. Outside it’s sunny, a little windy, and the temp is -6F with a -26F windchill. Lovely. The process of getting here is a long one. Beginning in February or March with online job announcements and applications the next few months are busy filling out paperwork and completing the rigorous process to get medically PQ’d (Physically Qualified) to work in Antarctica. I finally deployed on October 8th. The first stop was Denver, Colorado. Everyone working on the continent must have a few days of OSHA and safety awareness training at the Raytheon Polar Services (RPSC) headquarters. This morning I woke at 0400, the shuttle picked us up at 0430 on the dot and we all made our way to the Antarctic Center near the Chch airport. We checked in and got a quick breakfast. Then taking a last look at the grass and trees, boarded the plane heading to the ice. The flight is about 5 hours, and if the weather changes it’s not uncommon to “boomerang” or turn around and fly back to Chch. If this happens it’s a LONG day. Most people fly down on a USAF C-17 Globemaster. Last year I was on that plane, but this year I was put on the Airbus – a regular commercial plane. There’s only one Airbus that flies down and it’s quite the luxury. Stewardesses with tea and coffee, seats that recline, much quieter than the military planes so earplugs aren’t required and you can listen to music. The best part though was having a window seat and getting some AMAZING views of the sea ice and transantarctic mountains on the way in to McMurdo. So here we are: McMurdo Station Antarctica. Its Friday Oct 14th here (New Zealand time to make flights and schedules easier) and a lovely sunny spring day on the coldest, highest, driest continent on earth.